Real Madrid v Barcelona: The biggest game in club history? 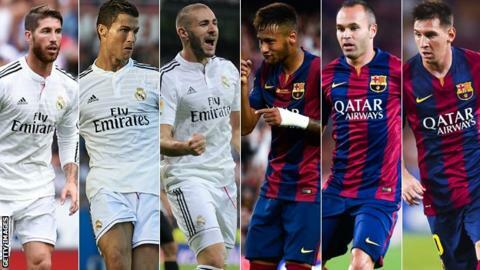 With the likes of Cristiano Ronaldo, Neymar and Lionel Messi in the mix, is this the biggest game in club history? Ronaldo. Messi. Neymar, Suarez and Rodriguez. In the unlikely scenario that any Real Madrid v Barcelona contest ever needed revving up, there it is: on 25 October, a single match starring the two best players in the world, the World Cup's leading scorer, four of the five most expensive players in history and the debut of the most controversial footballer of his generation. And all this without the injured Welsh star Gareth Bale. An occasion like no other before? Hype can make giddy fools of us all, and this is a fixture that has never lacked subplots or superstars. From the era of Alfredo Di Stefano and Ferenc Puskas in the 1950s and 60s through to Johan Cruyff and Diego Maradona in the 1970s and 80s, these are clubs accustomed to foreign stars at their fulcrum. Madrid defined themselves a decade ago by their galacticos, the annual superstar arrivals under spendthrift club president Florentino Perez. Either side of the new century Barcelona built title-winning teams around their own imported heroes: Michael Laudrup and Bernd Schuster; Romario, Patrick Kluivert and Ronaldinho. The arms race has accelerated before. Nine years ago we witnessed an equally star-studded Clasico collision, when Madrid's 4-2 win at the Bernabeu saw David Beckham, Raul, World Cup winners Zinedine Zidane, Ronaldo and Roberto Carlos plus Michael Owen pull apart a Barca side decorated by Ronaldinho, Samuel Eto'o, Xavi and Andres Iniesta. So why the feeling this week that Saturday night in Madrid might outstrip them all, even with the caveats that history brings? Part of it is the supporting cast, in which Argentine World Cup finalist Javier Mascherano, Xavi and Iniesta on one side and World Cup winner Toni Kroos and Luka Modric on the other, could all play decisive roles. Part of it is the challenges both sides face - Barca in rebuilding from a barren last season, Champions League winners Madrid in maintaining a continental pre-eminence while also waging a successful campaign on home soil. Then there is the fascination with Suarez, a grinning contradiction capable of both brilliance and brutality, a street-hustler talent risen to high society, a repeat offender that some wanted banned for far longer after biting Italy's Giorgio Chiellini and others cannot wait to welcome back. On its own his return to first-team football would eclipse all other plotlines this weekend. In South American tandem with Messi, supposedly player of the tournament in Brazil last summer, and Neymar - who threatened to be - you have the sort of fantasy combination that usually only comes from the computer console. Beyond the individual stars there are wider battles to savour. La Liga versus the Premier League, Spain's grand old giants against Europe's foreign-owner oligarchs, fantasy versus financial logic. Even as La Liga continues to haemorrhage home-grown talent to those other leagues, with current internationals like David Silva, Diego Costa, Juan Mata and Cesc Fabregas all in the Premier League, even as its other clubs struggle with mounting debt and shrinking attendances, the glittering line-ups in Madrid on Saturday night reflect a sporting and commercial wealth that no other modern-day club fixture can match. "Ronaldo and Messi are, if anything, better than last season. It is so hard to call but I would go for Real to edge it this time. It will be full of absolutely everything - quality, intensity and lots of incident. It is becoming an unmissable event." To the rest of Spain, mired in recession, a quarter of its working population on the dole, youth unemployment running at more than 50%, this El Clasico is extravagance from another world. Current champions Atletico Madrid ran up £141m in unpaid taxes in their frantic attempts to reach footballing parity. Even so they lost top scorer Costa and star defender Filipe Luis to the bigger wages on offer at Chelsea. Deportivo La Coruna, another club who once broke the hegemony in winning the league in 2000, are now just broke. The average attendance of 14 of the 20 top-flight teams this season is less than 24,000. More than half of La Liga's teams spent less each on players this summer than Suarez will earn in six months (£5m). To those with noses pressed against the window, the illogical attraction of this game is reminiscent of Dallas and Dynasty to recession-hit 1980s Britain: never mind the nasty real world, take shelter in the fantasy one. To the Premier League, with its global revenues in 2013-14 of £3bn twice that of La Liga, there is another clear message. You might have your own heavyweight clash this weekend in Manchester United v Chelsea, but who has the finest parade of talent? According to the latest Forbes list, Madrid (valued at £2.1bn) and Barcelona (£2bn) are the two richest clubs in the world, worth approximately £350m and £250m more respectively than Manchester United at £1.75bn, and with values four times those of Chelsea and Manchester City. All three of those English clubs pay big fees and huge wages. Yet even United's summer splurge cannot match the largesse exemplified by Barcelona in their deal for Neymar, when the Catalonians paid £34m in compensation and fees just to the player's father, £8m to his son for signing and a further £9m a year in wages, let alone the actual transfer fee to former club Santos. This match is so dense with brilliance because these two clubs are operating on a different economic paradigm. When you operate a simple football club, you require winning players. When you want to be a global brand, you need superstars. Looking back 40 years, 60% of Barcelona's revenues came from memberships. Today, according to club vice-president Javier Faus, those supporters in situ account for less than 10%. Shirt sponsorship, kit deals and television revenue provide both the funds and justification for these superstar ensembles. Ronaldo has just gone past 100m Facebook followers. Messi has 70m, in addition to 30m Twitter followers. Wayne Rooney, Britain's most followed footballer, has less than a third of that. This match is simultaneously a reflection of the rise of sport's celebrity culture and key component. Barca's official Facebook page has had 77 million likes, Real Madrid's 75m. Manchester United's has had 60m, Chelsea's 37m. On Twitter, Real Madrid have more than 13m followers, Barcelona 12.9m. Manchester United and their cross-town rivals City 3.5m and 2m respectively. This is how clubs extend themselves in the brave new world and how they hope to spread their appeal to new markets. Hence the big names. Hence the hype around this perfect showcase. Hence the 17:00 BST kick-off, timed perfectly to attract early risers in South America, the wealthy benefactors of the Middle East (Real's shirt sponsor is the Emirates airline, Barcelona's Qatar Airways) and the big-spending supporters in Asia. None of which, of course, guarantees that these particular 90 minutes will justify the pre-match anticipation. Great line-ups do not always equal great football, as at least six of the last seven World Cup finals demonstrate; not since Argentina beat West Germany 3-2 in 1986 has there been a contest to match the occasion. Which FA Cup final would you rather watch again - the tedious stalemates of 2007 or 1996, when the most star-studded teams in the competition (Manchester United and Chelsea, United and Liverpool) provided the most prosaic of conclusions, or the see-sawing thrills of 2014 or 2006 when the respective line-ups of Liverpool v West Ham and Arsenal v Hull promised little more than a straightforward stroll? You could keep going from outside football's narrow confines: the showdown between Denman and Kauto Star at the 2010 Cheltenham Gold Cup being in the end all about Imperial Commander; the rugby World Cup final in 2011 between a rampant New Zealand and cavalier France ending in the lowest-scoring final in the competition's history. Then again, this is El Clasico, and this is a chapter with myriad storylines. In just three weeks last season we saw Messi's hat-trick in Barca's 4-3 win at the Bernabeu and Bale's extraordinary goal to win the Copa del Rey. Few will be expecting anything less this time than the rich cast promises.